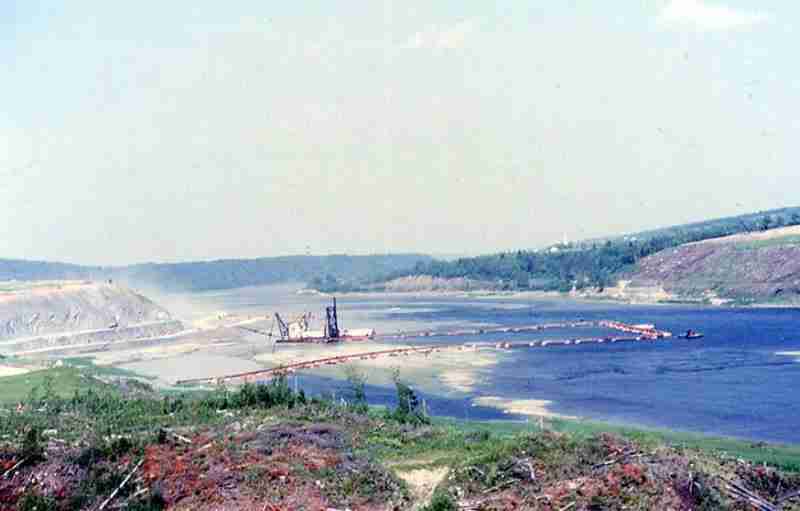 The Mactaquac Dam is an embankment dam used to generate hydroelectricity in Mactaquac. 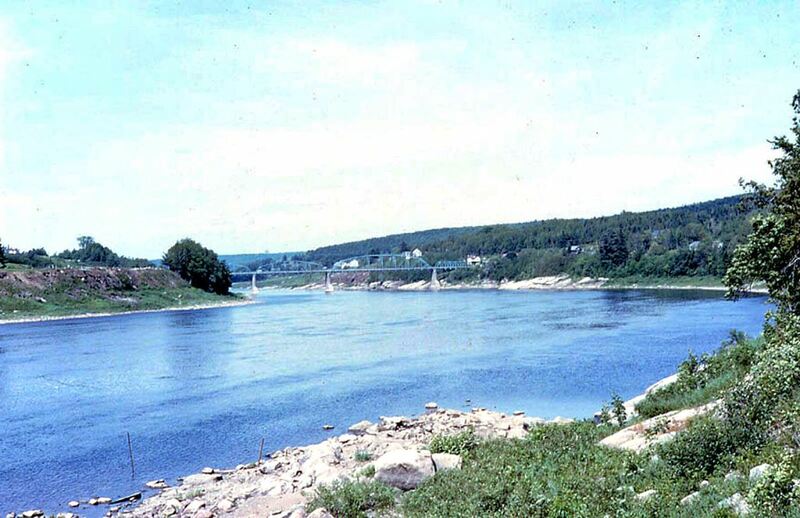 It dams the waters of the Saint John River and is operated by NB Power with a capacity to generate 653 megawatts of electricity from 6 turbines; this represents 20 percent of New Brunswick’s power demand. 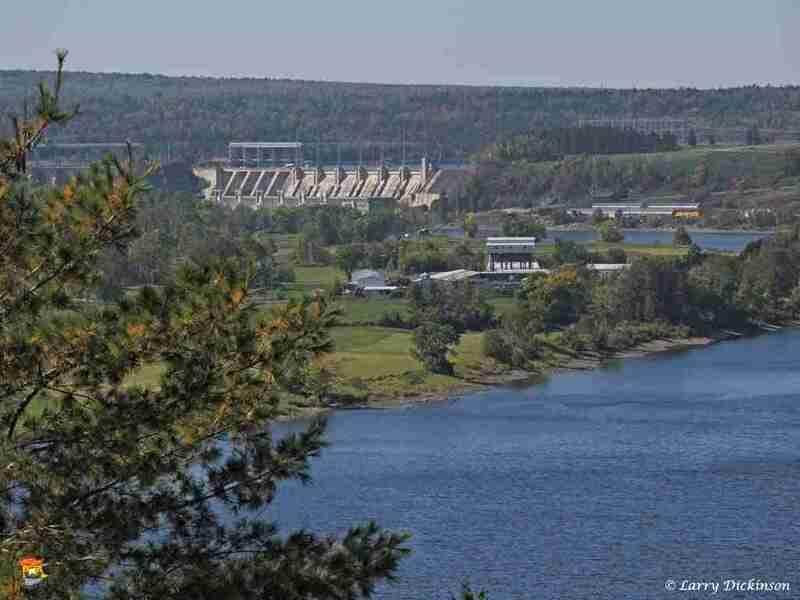 Formally called the Mactaquac Generating Station, the dam and power house are located approximately 15 km (9.3 mi) upstream from the city of Fredericton. 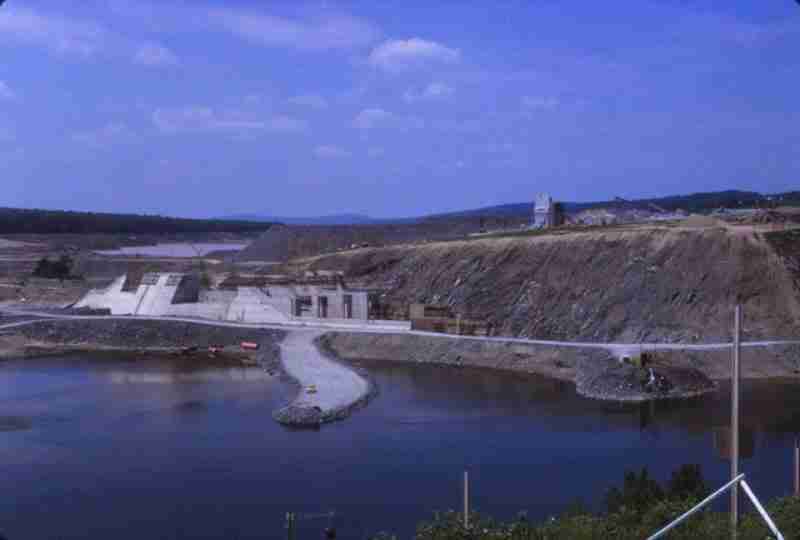 The dam is an embankment dam consisting of a rock-fill structure sealed by clay. 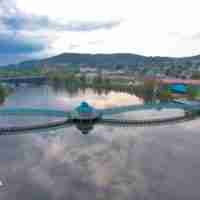 It combines with two concrete spill-ways to form an arch across a narrow section of the river between the communities of Kingsclear on the west bank, and Keswick Ridge on the east bank. 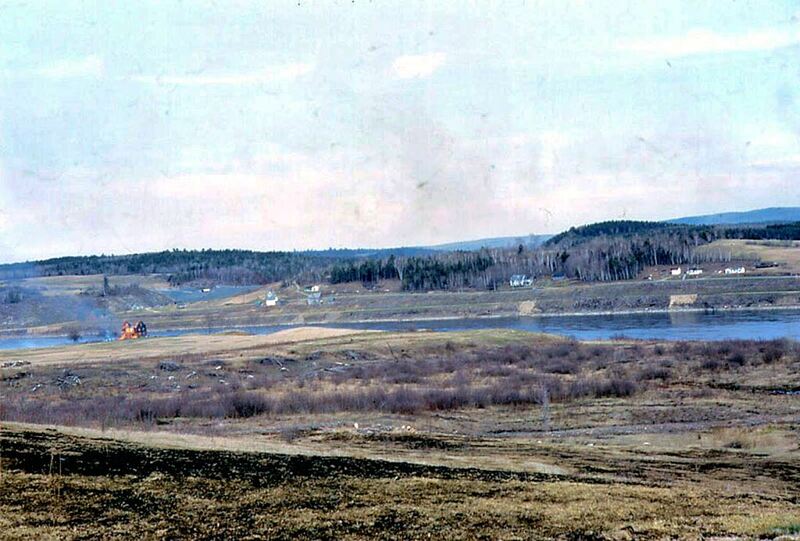 Rising 40 metres in height above the river level, the reservoir (referred to locally as the “head pond”) covers 87 square kilometres and extends 96 kilometres upstream, near Woodstock. 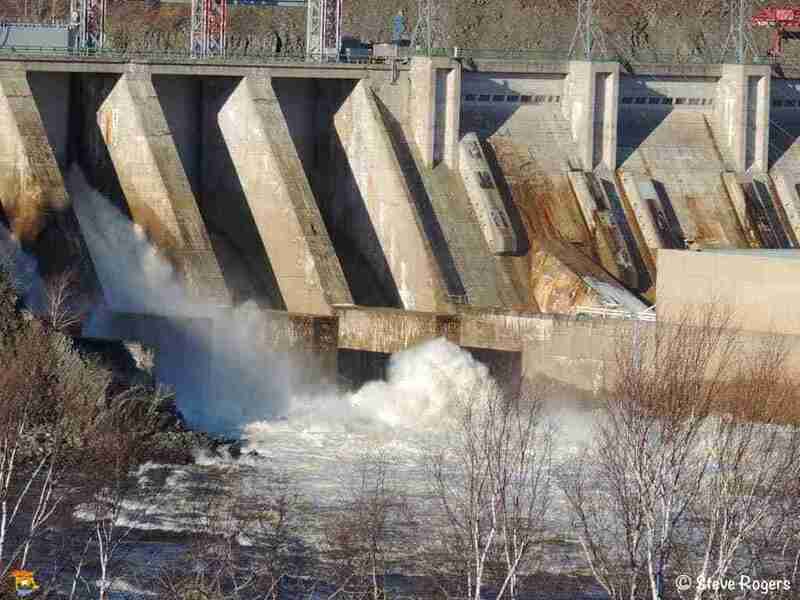 The dam and powerhouse are a “run of the river” design, meaning that the reservoir has no additional holding capacity in the event of unusually high water flows, such as during the spring freshet. 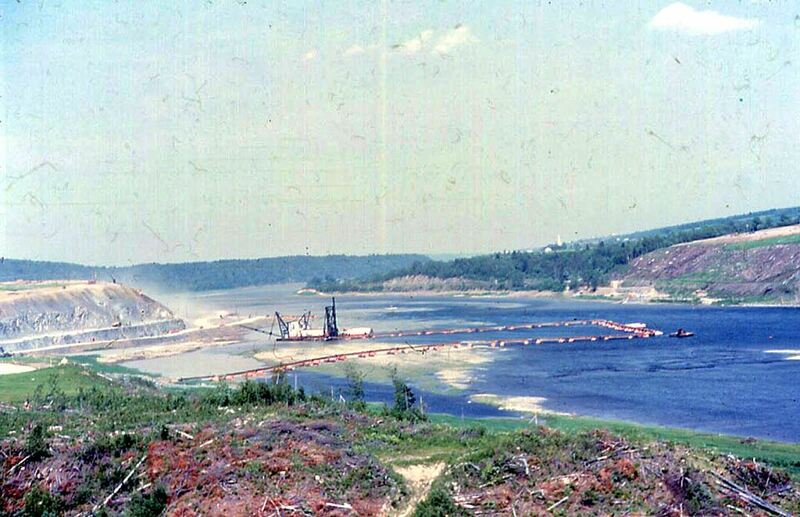 The concrete portions of the dam (namely the spill-ways) are currently experiencing a problem of expanding concrete. 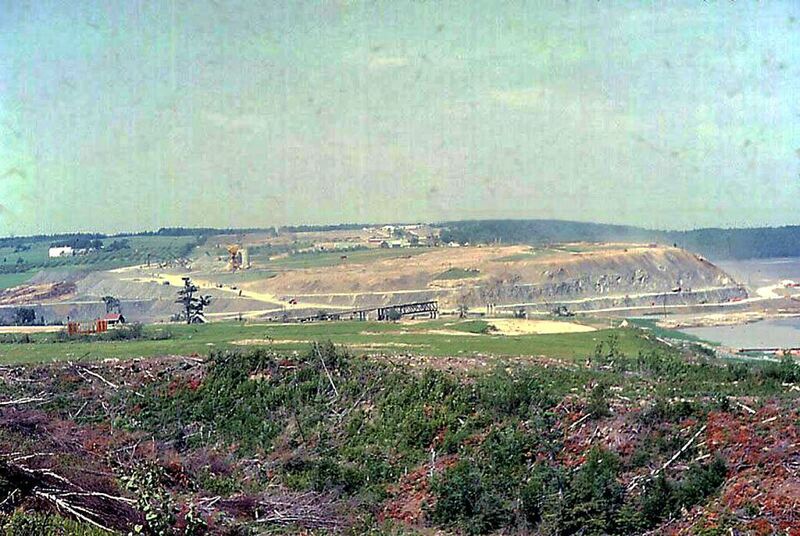 When built, locally quarried greywacke was used as the aggregate and is believed to be responsible for the alkali-aggregate reaction expansion. The dam is being monitored and extra maintenance work is being performed, although the spill-way is expected to have a reduced life expectancy. 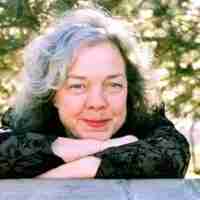 The earliest projections put the dam’s end-of-life at 2028, instead of the original 100-year lifespan of 2068. 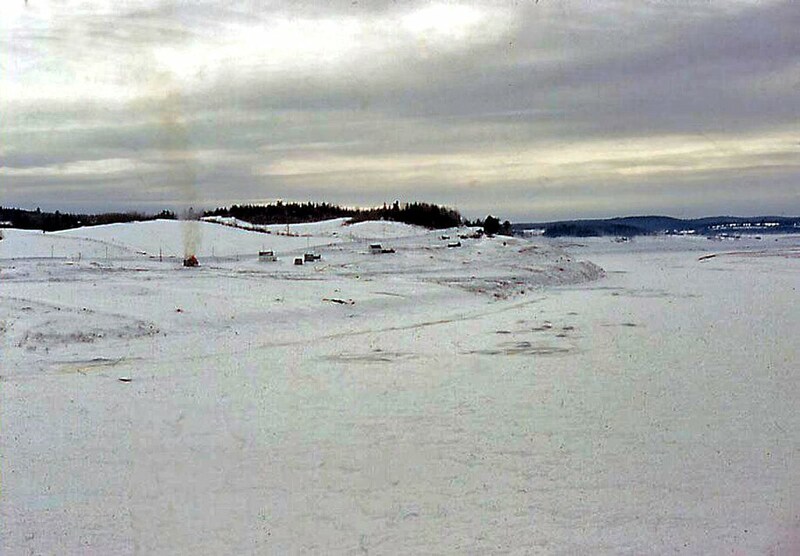 The Mactaquac Dam also has a fishway to catch salmon and transport them upriver. Electrical generation began in 1968 after the reservoir had completely filled. 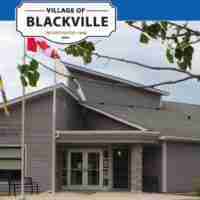 The flooding of the valley resulted in the displacement of several thousand residents and land owners in areas such as Bear Island and other small communities, as well as the abandonment of a Canadian National Railway line and numerous local roads and several communities. 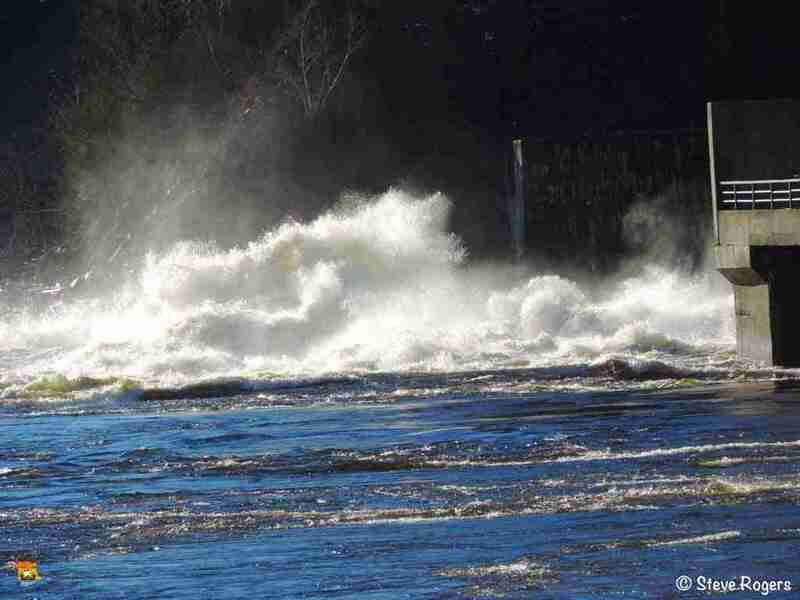 A historic waterfall was also submerged as the reservoir filled. 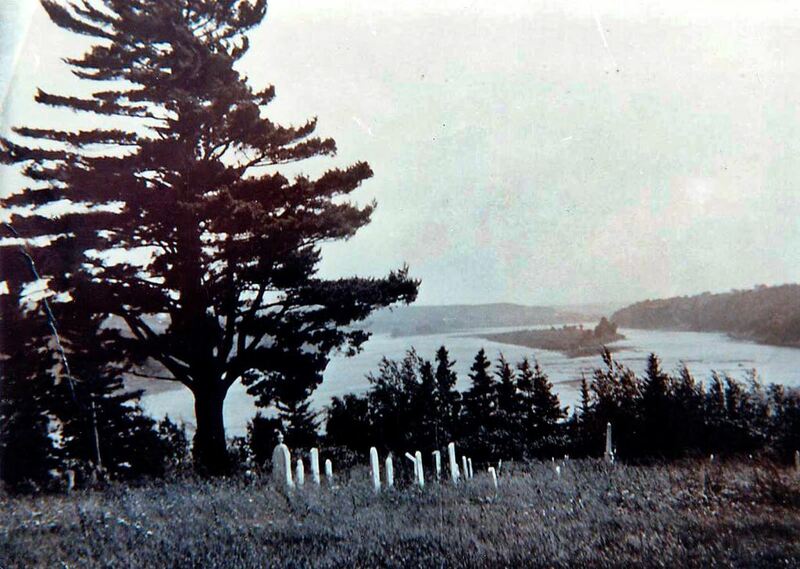 A view of the St. John River and the Mactaquac area before the dam was built. 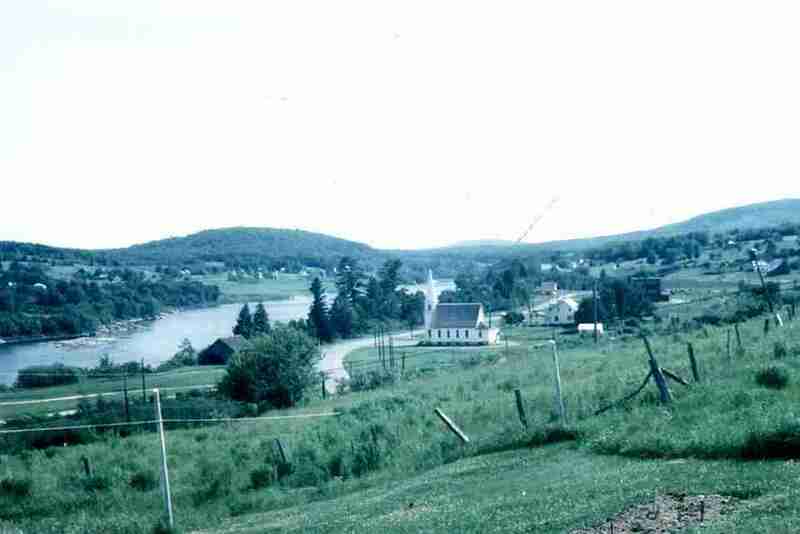 The planned town of Nackawic and the nearby Ste. Anne Nackawic pulp and paper mill were built to accommodate the new reservoir and power opportunities. 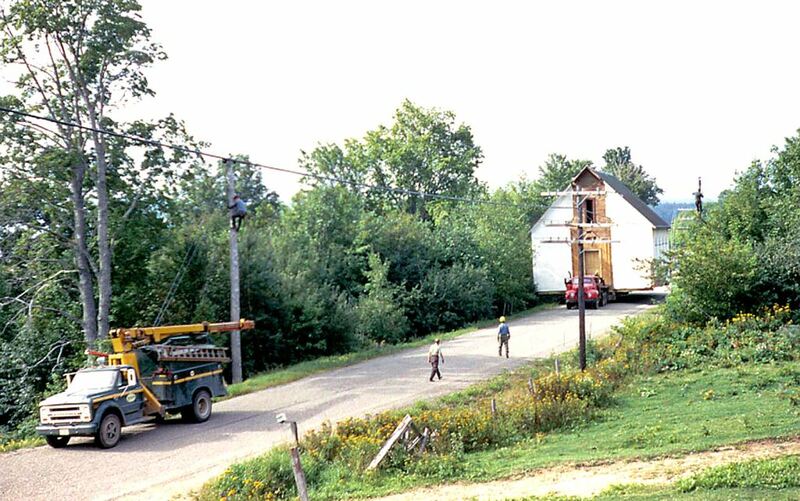 Following the success of preserving historic buildings at Upper Canada Village when the upper St. Lawrence River valley was flooded by the Long Sault Dam, the government of New Brunswick created the Kings Landing Historical Settlement to save several buildings which would otherwise have been flooded by the Mactaquac Lake. 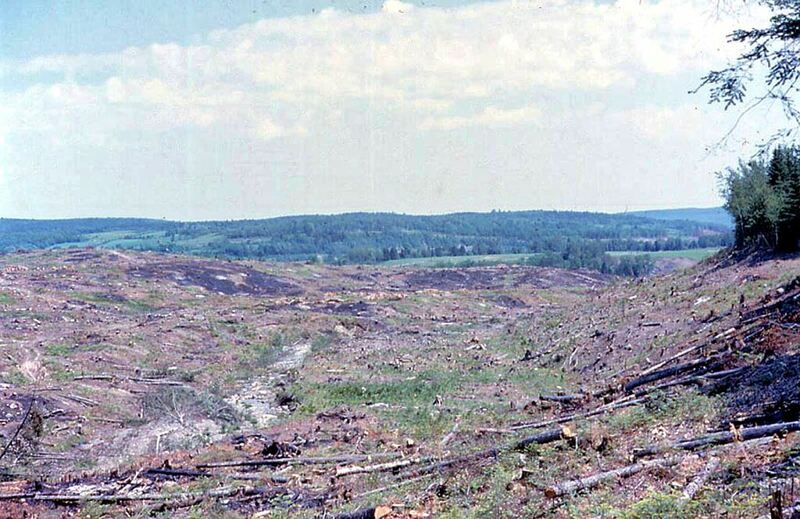 Mactaquac Provincial Park was also created as a result of the dam. This post has already been read 934 times!